Lamentation chanted in honor of the dead; it has a halting movement peculiar to itself, and ranges from a dirge or wail to the elegiac form (comp. David's elegies on the deaths of Saul and Jonathan [II Sam. i. 17] and on the death of Abner [ib. iii. 33]). The term is derived, according to Wetstein, from the Arabic "ḳana" (= "to form artistically"); it occurs once, in Ezek. ii.10, as "ḳinim." Among the Hebrews, as in many Semitic lands at the present day, the ḳinah was sung by professional mourning-women (Jer. ix. 17). In prophetic literature such elegies were chanted also over inanimate objects poetically personified. To this class belong the ḳinot on the and plains, deserted by all living things (Jer. ix. 10), on fallen cities (Ezek. xxvi. 17, xxvii. 1), and on lands and peoples (see Budde, "Das Hebräische Klagelied,"in Stade's "Zeitschrift, ii. 1 et seq. ; idem, "The Folk-Songs of Israel in the Mouths of the Prophets,"in "The New World," pp. 28 et seq., Boston, 1893). Even in the Talmudic period a ḳinah was sung at a burial by at least one mourning-woman, who was accompanied by two flute-players (Yer. M. Ḳ. i. 5; Ket. 46a; comp. Shab. 153a). Fragments of elegies of this period, composed by the "safdana" (funeral orators), have been preserved (M. Ḳ. 28b; comp. I. Perles, "Die Leichenfeierlichkeiten im Nachbiblischen Judenthume,"in "Monatsschrift," x. 382 et seq.). To the ḳinah was soon added the Funeral Oration, which steadily increased in importance as compared with the ḳinah, until the latter was omitted entirely. But although the ḳinah was thus excluded from the public funeral rites, it still survived as an individual expression of grief for the loss of friends or kinsmen (see Poetry, Biblical). From the individual, or personal, ḳinah must be distinguished the national, or general, ḳinah, the subject of which is the misfortune of the whole nation or of a single community. The national ḳinah was created by Amos, the oldest of the prophets whose writings have survived, on the occasion of a harvest festival in Beth-el, about 760. Foreseeing the impending destruction of the Northern Kingdom, he chanted in the midst of the populace, as though destruction had already overtaken it, "The virgin of Israel is fallen; she shall no more rise" (Amos v. 2). But the national ḳinah found its most perfect expression in the "lamentations" which both Talmud and Midrash ascribe to the prophet Jeremiah (B. B. 14b; Yer. Shab. xvi. 15c; Lev. R. xv. 4). Even as early as the Talmudic period, the ḳinot of Jeremiah were recited on the eve of the 9th of Ab, the anniversary of the (destruction of the Temple and of the Jewish state (Yer. Shab. l.c. ; Lev. R. l.c.). It seems that, at least in Palestine, the Epistle of Baruch (the portion of the Book of Baruch written originally in Hebrew—i. 1—iii. 8), which was a national confession of sins and a justification of the divine punishment, was read also during the public service of this day (see Jew. Encyc. ii. 557, s.v. Baruch). The more intolerable conditions became for the Jew in the following centuries the more he loved to commemorate the events of the happier past. New wos created new ḳinot, and therefore the Jew could not confine himself to the recitation of the Lamentations of Jeremiah on the 9th of Ab. Even the Hellenistic period, poor as far as national poetry is concerned, brought into existence an elegy on the destruction of Jerusalem (Greek Apoc. Baruch, x. 6-8). This was originally written in Hebrew, but it is not known that it had a place in the ritual of the Synagogue (see Jew. Encyc. ii. 556, s.v. Baruch). Early in the geonic period the poets of the Synagogue began to compose seliḥot, ḳinot, and hosh'anot, although very little of that literature has survived (Delitzsch, "Zur Gesch. der Jüdischen Poesie," p. 51; Maḥzor Vitry, ed. Hurwitz, p. 226). Among the older Spanish, North-African, and Provençal poets the national or general elegies for the service of the 9th of Ab were the product of innate poetical feeling, while among the Roman-German poets it was distress and desperation that brought new ḳinot into existence. "I must speak; I must have air; my soul, embittered by grinding slavery, is overwhelmed," says the German synagogal poet of the thirteenth century (Zunz, "S. P." p. 176). Thus the essence of the ḳinot consists in a lamentation over the loss of the nation's past greatness, as well as (in the Roman-German rites and among the. younger poets) over the disastrous events of the present. In the Siddur of Amram Gaon (ed. 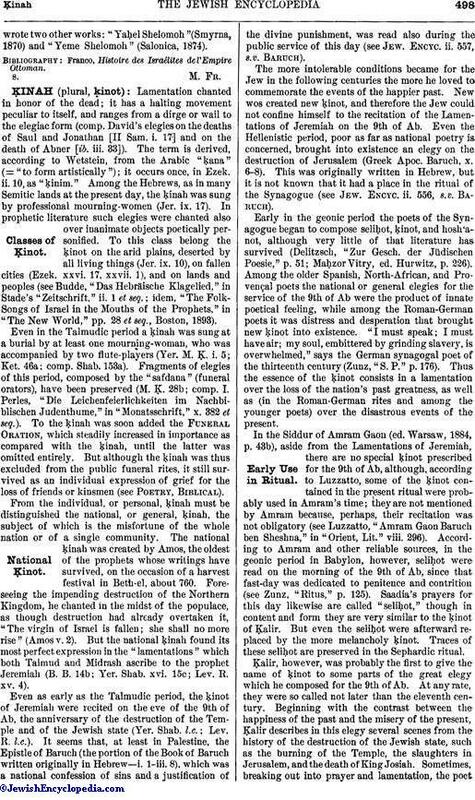 Warsaw, 1884, p. 43b), aside from the Lamentations of Jeremiah, there are no special ḳinot prescribed for the 9th of Ab, although, according to Luzzatto, some of the ḳinot contained in the present ritual were probably used in Amram's time; they are not mentioned by Amram because, perhaps, their recitation was not obligatory (see Luzzatto, "Amram Gaon Baruch ben Sheshna," in "Orient, Lit." viii. 296). According to Amram and other reliable sources, in the geonic period in Babylon, however, seliḥot were read on the morning of the 9th of Ab, since that fast-day was dedicated to penitence and contrition (see Zunz, "Ritus," p. 125). Saadia's prayers forthis day likewise are called "seliḥot," though in content and form they are very similar to the ḳinot of Ḳalir. But even the seliḥot were afterward replaced by the more melancholy ḳinot. Traces of these seliḥot are preserved in the Sephardic ritual. Ḳalir, however, was probably the first to give the name of ḳinot to some parts of the great elegy which he composed for the 9th of Ab. At any rate, they were so called not later than the eleventh century. Beginning with the contrast between the happiness of the past and the misery of the present, Ḳalir describes in this elegy several scenes from the history of the destruction of the Jewish state, such as the burning of the Temple, the slaughters in Jerusalem, and the death of King Josiah. Sometimes, breaking out into prayer and lamentation, the poetexpresses his conviction of his own guiltiness and of the justice of the Lord, laments the power of Edom, and mourns the misery of Zion, for the restoration of which he prays; he closes with a description of the final redemption of Israel and the future salvation. This elegy, consisting of about 12,000 words, beginning with the Eighteen Benedictions ("Ḳerobah") and concluding with prayers of comfort ("neḥamot"), has been preserved almost in its original form in the older Roman rite. Whereas the latter uses Ḳalir's ḳerobah "Zekor Ekah," the German ritual has Ḳalir's second ḳerobah, beginning with "A'abik," which is of a more general character, and which was, perhaps, originally destined by Ḳalir for the service on the afternoon of the 9th of Ab. Moreover, in the German rite consolations are wanting; they are replaced, however, by other ḳinot composed between the twelfth and sixteenth centuries. In the German rite then follow the "Zionides," which are named after the well-known elegy on Zion of Judah ha-Levi, beginning with "Ẓiyyon Halo Tish'ali." This elegy is to be found in every Jewish ritual for the 9th of Ab, and from it a special "Zionide" meter and rime have been developed (see Dukes, "Zur Kenntniss der Neuhebr. Religiösen Poesie," p. 71; Delitzsch, "Zur Geseh. der Jüdischen Poesie," pp. 159-163). The "Zionides" are not usually recited by the ḥazzan himself, but by members of the congregation, alternately; at one time they were recited by the most prominent member. Abraham Ḥozeh ("Astronomer"): "Ẓiyyon Ḳeḥi Kol Ẓori Gile'ad" (Zunz, "Literaturgesch." p. 490; translated into German by J. Freund, in Karpeles, "Zionsharfe," p. 43). By some scholars this elegy is ascribed to Solomon ibn Gabirol, and by others to Elijah ha-Zaḳen. Abraham ben Jacob: "Ẓiyyon Asher Yomeru" (Zunz, l.c. Supplement, p. 26). Abraham ben Meïr (perhaps a contemporary of Abraham ben David): "Esh'ag mi-Nahamat Libbi we-Et'onen," describing the punishment of a Jewish community such as was often visited upon the communities of Germany and England in the twelfth and thirteenth centuries (Zunz, l.c. p. 464). Eleazar ha-Ḳalir: "Ḳerobah." and the first seventeen ḳinot (from "Shabat Suru Menni" to "Amarti She'u Menni "; see Luzzatto, "Mebo le-Maḥzor ke-Minhag Bene Roma," pp. 24 et seq.). Eleazar b. Judah b. Kalonymus of Worms (author of "Ha-Roḳeaḥ"): "Ẓiyyon Halo Tish'ali Ii-Shelom 'Alubayik" (first Zionide), on the slaying of his wife and children in Erfurt in 1214 (Zunz, l.c. p. 320). Eleazar b. Mosheh ha-Darshan of Würzburg: "Ẓiyyon 'Aṭeret Ẓebi Simḥat Hamonayik" (Zionide). Baruch; b. Samuel (died in Mayence in 1221) "Eẓbe'otai Shafelu we-Osbyotai Nafelu, Oyah." David ha-Levi ben Samuel (contemporary and correspondent of Rashi): "Emunim Shararu be-Tok Yam 'Aberu" (Zunz, l.c. p. 164). David b. Alexander (date unknown): "Ezkerah Neginotai" (Zunz, l.c. p. 483). Judah b. Moses ha-Kohen (c. 1240; German rabbi): "We-Et'onen wa-Aḳonen Marah," on the riot in Frankfort-on-the-Main in 1241 (Zunz, l.c. p. 479). Judah ha-Levi of Castile: "Ẓiyyon Halo Tish'ali " (Zionide); "Yom Akpi Hikbadti" (Zunz, l.c. p. 206). Joel ha-Levi ben Isaac of Bonn: "Yibkeyun Mar Mal'ake ha-Shalom," lamentation for the victims of the Second Crusade, which occurred during his lifetime (Zunz, l.c. p. 269). Joseph ben Kalonymus ha-Naḳdan (c. 1238): "Amorer ba-Beki" (Zunz, l.c. p. 98). Jehiel b. Jacob of Eisenach (who witnessed the persecution at Fulda): "Asirim be-Shir Yeẓe'u," contrasting the time of the wandering of the Israelites in the desert and that of the destruction of the Temple (Zunz, l.c. p. 29). Jacob: "Ẓiyyon Yedidut Yadid" (Zionide). Isaac (12th or 13th cent. ): "Azkir Rahab" (Zunz, l.c. p. 552). Yaḳar ben Samuel ha-Levi (contemporary of Meïr of Rothenburg:, lived in Cologne and Mayence) "Ẓiyyon Adonai Lakem." Kalonymus ben Judah of Mayence (11th cent. ): "Mi Yitten Roshi Mayim"; "Amarti Sbe'u Menni"; both dedicated to the victims of the Second Crusade (Zunz, l.c. p. 166). Meïr b. Baruch of Rothenburg: "Sha'ali Serufah," on the public burning of the scrolls of the Law in Paris about 1254 (see Grätz, "Gesch." vii. 405; translated into German by A. Geiger, "Jüdische Dichtungen," Leipsic, 1856). Having the strophic rhythm of the Zionides, it found a place among them. Meïr ben Jehiel: "Arze ha-Lebanon," describing the death of the ten martyrs and based upon Midrash Eleh Ezkerah (Zunz, l.c. p. 489; Landshuth, "'Ammude ha-'Abodah," p. 161). Michael b. Perez (before 1550): "Ẓiyyon Menat Shalom"; "Ẓiyyon Ḳedosh Mishkene 'Elyon" (Zionides; Zunz, l.c. p. 580). Menahem ben Jacob of Worms (d. 1203): "Me'one Shamayim" (Zunz, l.c. p. 294). Menahem b. Makir of Regensburg (survived the First Crusade): "Ebel A'orer" (Zunz, l.c. p. 158). Menahem Zion b. Meïr (c. 1430; author of the "Ẓiyyuni"): "Ẓiyyon Me'on Ḥeshḳi" (Zunz, l.c. p. 523; idem, "S. P." p. 110). Moses ben Jacob: "Ẓiyyon Me'oz Ẓiryat Melek" (Zionide; Zunz, "Literaturgesch." p. 388; Landshuth, l.c. p. 245). Solomon ibn Gabirol: "Shomeron Ḳol Titten" (Zunz, "Ritus der Synagoge von Avignon," in "Allgemeine Zeitung des Judenthums" , ii. 454; comp. also J. L. Gordon, "Letters," pp. 98, 216); "Shekurat Lo mi-Yayin." 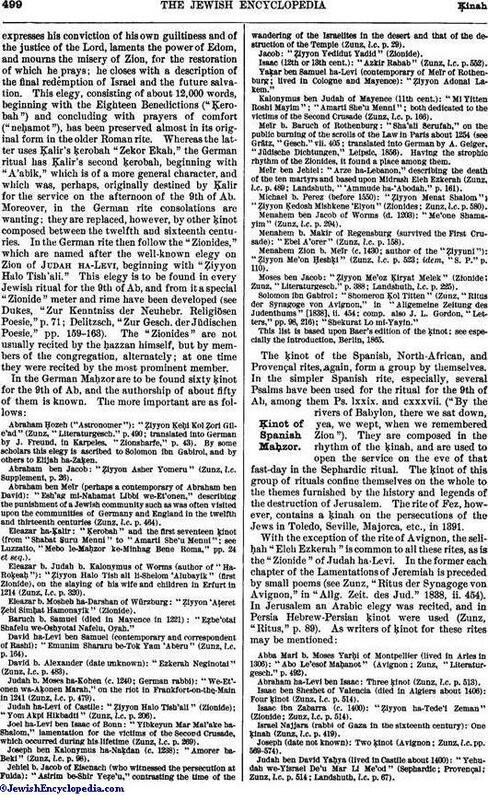 This list is based upon Baer's edition of the ḳinot; see especially the introduction, Berlin, 1865. The ḳinot of the Spanish, North-African, and Provençal rites, again, form a group by themselves. In the simpler Spanish rite, especially, several Psalms have been used for the ritual for the 9th of Ab, among them Ps. lxxix. and cxxxvii. ("By the rivers of Babylon, there we sat down, yea, we wept, when we remembered Zion"). They are composed in the rhythm of the ḳinah, and are used to open the service on the eve of that fast-day in the Sephardic ritual. The ḳinot of this group of rituals confine themselves on the whole to the themes furnished by the history and legends of the destruction of Jerusalem. The rite of Fez, however, contains a ḳinah on the persecutions of the Jews in Toledo, Seville, Majorca, etc., in 1391. Abba Mari b. Moses Yarḥi of Montpellier (lived in Arles in 1306): "Abo, Le'esof. Maḥanot" (Avignon; Zunz, "Literaturgesch." p. 492). Abraham ha-Levi ben Isaac: Three ḳinot (Zunz, l.c. p. 513). Isaac ben Sheshet of Valencia (died in Algiers about 1406): Four ḳinot (Zunz, l.c. p. 514). Isaac ibn Zabarra (c. 1400): "Ẓiyyon ha-Tede'i Zeman (Zionide; Zunz, l.c. p. 514). Israel Najjara (rabbi of Gaza in the sixteenth century): One ḳinah (Zunz, l.c. p. 419). Joseph (date not known): Two ḳinot (Avignon; Zunz, l.c. pp. 569-574). Judah ben David Yaḥya (lived in Castile about 1400): "Yehudah we-Yisreal De'u Mar Li Me'od" (Sephardic; Provençal; Zunz, l.c. p. 514; Landshuth, l.c. p. 67). Judah b. Jacob: "Yomam we-Layelah Ebkeh" (Carpentras; Zunz, l.c. p. 567). Judah ha-Levi: The same as in the Roman-German ritual. Moses Nathan: "Mi-Gam Bakem" (Avignon; there are two synagogal poets of this name, Zunz, l.c. p. 517). Moses Zacuto (of Spanish descent; lived and died in Italy): "Arim Ḳol Bikyl" (Sephardic; Zunz, l.c. p. 440; Landshuth, l.c. p. 218). Samuel (time unknown): "Oyah Ereẓ Ẓilẓul" (Avignon; Zunz, l.c. p. 593). Sheshet: "Ekah Ya'ib" (Avignon; Zunz, l.c. p. 475). Simeon ben Ẓemaḥ Duran (lived in Algiers, 1361-1444). Three ḳinot (Zunz, l.c. p. 522). Solomon ibn Gabirol: "Shomeron Ḳol Titten" (Avignon, Roman-German, Polish, etc.). Solomon b. Bonfed: Six ḳinot (Zunz, l.c. p. 518). Zerahiah ben Isaac Gerundi of Lunel (author of the "Ma'or"): "Ze'ebe 'Ereb" (Provençal; Sephardic; Zunz, l.c. p. 461; Landshuth, l.c. p. 63). 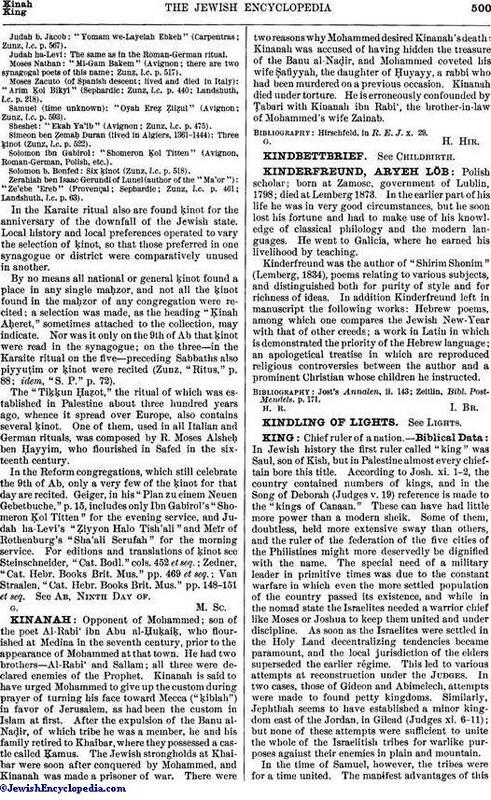 In the Karaite ritual also are found ḳinot for the anniversary of the downfall of the Jewish state. Local history and local preferences operated to vary the selection of ḳinot, so that those preferred in one synagogue or district were comparatively unused in another. By no means all national or general ḳinot found a place in any single maḥzor, and not all the ḳinot found in the maḥzor of any congregation were recited; a selection was made, as the heading "Ḳinah Aḥeret," sometimes attached to the collection, may indicate. Nor was it only on the 9th of Ab that ḳinot were read in the synagogue; on the three—in the Karaite ritual on the five-preceding Sabbaths also piyyuṭim or ḳinot were recited (Zunz, "Ritus," p. 88; idem, "S. P." p. 72). The "Tiṭṭun Ḥaẓot," the ritual of which was established in Palestine about three hundred years ago, whence it spread over Europe, also contains several ḳinot. One of them, used in all Italian and German rituals, was composed by R. Moses Alsheḥ ben Ḥayyim, who flourished in Safed in the sixteenth century. In the Reform congregations, which still celebrate the 9th of Ab, only a very few of the ḳinot for that day are recited. Geiger, in his "Plan zu einem Neuen Gebetbuche, " p. 15, includes only Ibn Gabirol's "Shomeron Ḳol Titten" for the evening service, and Judah ha-Levi's "Ẓiyyon Halo Tish'ali "and Meïr of Rothenburg's "Sha'ali Serufah" for the morning service. For editions and translations of ḳinot see Steinschneider, "Cat. Bodl." cols. 452 et seq. ; Zedner, "Cat. Hebr. Books Brit. Mus." pp. 469 et seq. ; Van Straalen, "Cat. Hebr. Books Brit. Mus." pp. 148-151 et seq. See Ab, Ninth Day of.